I hope Psalm 40 is your testimony. David waited on God, and God heard him, lifted him up out of the depths of sin, and put a new song in David’s mouth. David knows how blessed are we who put our trust in God, who hide His Word in our hearts, who obey Him, and tell others about Him. David is honest to say life was still hard for him. But even in that, he proclaimed God’s mercy, God’s love, and God’s saving power. Knowing God was in his life gave David reason to rejoice. It does the same for me. God is our help and deliverer. That’s my testimony. I pray you can say the same. This entry was posted in Christianity, Daily devotions and tagged God's love, God's Presence, mercy, salvation, trusting God on April 23, 2019 by cazehner. I love reading God’s Word. I look forward every day to opening my Bible and reading what God says to me. I believe every chapter, every verse, every word is included in these precious pages for an eternal reason. So when He inspired men to repeat a phrase, or an entire story, I sit up and take notice. I figure God must think there is something there He doesn’t want me to miss. Today I read two psalms that are almost identical. Sources say it wasn’t unusual for musicians to adapt a song to their own style, much like contemporary artists who re-work hymns to their own styles. But why would God inspire men to include two versions of the same psalm in the Bible? I took a closer look. Both psalms being with,”The fool says in his heart there is no God.” In reality, these fools are corrupt and vile. But the psalms go on and say God is looking for anyone who understands and seeks Him. They say things like, all have turned aside, all are corrupt, no one is good. Not even one. Now wait a minute. Does the psalmist dare to put all people in the same category as a vile atheist? Even me? Say it isn’t so. I guess you don’t have to verbally pronounce you believe there is no God. How you live might be expressing the same belief just as clearly. The psalmists put people in two categories. Fools, and those who understand and seek God. I am reminded that Jesus said the greatest commandment was to love God with all our hearts, souls, and minds. Hebrews 11 tells us without faith it is impossible to please God, and that He rewards those who diligently seek Him. So I ask myself: Can I be a Christian and live like I’m not? Can I be a Christian and not read my Bible, pray, serve God, love God, and obey Him? When I think about it, I don’t see anything in the Bible about God recognizing a mediocre, or a half-Christian. Scripture repeatedly tells us it’s all or nothing. If we’re not for God, we’re against Him. We can’t serve two masters. So what might practical atheism look like in my life? Putting something or someone ahead of God in my life. Dishonoring God’s name. Not living a life set apart, not making disciples. Complaining, jealousy, selfishness, thinking myself more highly than I should. As I sit here and think about what practical atheism looks like, I come to realize that allowing any sin to exist in my life gives the message that I don’t really believe in God as He is presented in the Bible. Isn’t that what an atheist is? I thank God for the latter verses of these psalms, and for the Truth of Jesus Christ. Because there was a time when I was corrupt, vile, evil, and lived like I thought there was no God. That is, until I accepted Jesus as my Savior and became His precious child. Now, I want to live my life acknowledging the One who loved me and gave Himself for me. I want to live my life understanding and seeking Him, loving Him with all my heart, soul, and strength, diligently pursuing Him. I want to recognize sin in my life and repent of it immediately, understanding that God will not tolerate any sin. What does your life say about God? That there is a God you love and serve, a God who you seek diligently above all else. Or does your life say that you don’t really believe in God even though your words say you do? Practical atheism? That’s so foolish. This entry was posted in Christianity, Daily devotions, Sin, The Gospel and tagged all have sinned, atheism, belief in God, Christianity, forgiveness, practical atheism on April 22, 2019 by cazehner. Do you have an Abigail in your life? Someone who can calm you down when you are angry? Someone who speaks sense when you are off on a tangent? David would have killed Nabal were it not for Abigail. She made him see that his attitude was wrong, and David listened. I don’t know about you, but sometimes I need someone who can help me take a second look at what I’m doing or thinking, because I have been known to make a big deal out of something that really wasn’t even an issue. I perceive a wrong. I get angry and don’t let up. It builds and builds in my mind until I have to do or say something to even the score, or to set someone straight. That usually ends up badly. And it would have ended badly for David had he acted on his emotions. Sometimes we do need to speak up when bad things happen But what I see in this account is that allowing our emotions to dictate our actions is probably not the best way to handle things. Let’s speak truth to each other. Let’s listen when truth is spoken to us. Abigail is telling us to take a step back. To seek counsel. And to wait on the Lord. When God prompted Abigail to speak up, and when David listened to what God said through her, God’s will was able to be done. Nabal died without David having to carry the guilt of spilling his blood in a moment of rage. I thank God for the people in my life who are “Abigail” to me, who are able to talk me off the cliff, to help me calm down, or refocus my thinking. And I pray that God will give me the opportunity to be an “Abigail” to someone else when it’s needed. This entry was posted in Christianity, Daily devotions and tagged anger, be angry and do not sin, emotional responses, rage on April 22, 2019 by cazehner. It’s tempting to read David’s psalms and have a sense of satisfaction, thinking the people in our lives who have treated us badly will get what’s coming to them. It’s tempting to think God is telling us, “What goes around, comes around.” But does that sound like the God you know and love? If that were the case, Jesus wouldn’t have gone to the cross. The cross is totally about NOT getting what’s coming to any of us. Jesus died for sinners, not just people who were nice to Him. Jesus taught us to love our enemies, do good to people who aren’t good to us, pray for people who mistreat us. He never told us it was ok to secretly hope a house will fall on top of them, or even hope that someone will do to them what they did to us. So how are we supposed to read these psalms where David is asking God to destroy his enemies? We read them and ask God to destroy ours. But remember, David’s enemies were flesh and blood. Ours are not. Our enemy is Satan. Our enemy is sin, temptation, false teaching… We read these psalms, and instead of looking outward, pointing fingers at people who are mean to us, we take a good look within ourselves and identify the enemy that is attacking our own soul. THAT’S the enemy we want God to defeat, to destroy, to disgrace and put to shame. That’s the enemy we want to fall into the pit it has dug for us. Please don’t read these psalms with the name of someone who has hurt you in your mind. Read these psalms with one eye on yourself, and the other on God who wants you to have victory over sin, who delights in helping you win those battles with Satan. And as for that person who has hurt you? I would encourage to begin to pray that God will give them what they don’t deserve… Himself. After all, He did that for you. This entry was posted in Christianity, Daily devotions, Sin, The Gospel and tagged enemies, karma, praying for our enemies, what goes around comes around on April 20, 2019 by cazehner. My one year chronological Bible had me reading Psalm 22 today. Today is Good Friday. Today is the day we remember and celebrate the cross. Jesus was crucified on the Friday of Passover, and that would be today. Of course April 19 is not always Good Friday. But it is today in 2019. And reading Psalm 22 on this Good Friday touched me deeply. Those are the very words Jesus spoke from the cross hundreds of years after David wrote them down. Now, some might say it’s no big deal that Jesus quoted Scripture from the cross. He quoted Scripture all the time. But in verse 8 David tells us things that would be said about and to Jesus. Do you think Jesus’ enemies were quoting Scripture when they mocked him? They were trying to disprove His claims to be the Son of God. I doubt they’d pick a verse to quote that might support His claim. And don’t even try to tell me the Romans studied Psalm 22, then crucified Jesus accordingly. Read verses 16-18. The piercings, the intact bones, the gambling at the foot of the cross. Those things happened just like God said through David. It is truly amazing. Crucification wasn’t even a thing when David wrote this psalm. What we celebrate on Good Friday isn’t just a story about a nice guy being killed for something he didn’t do. It’s not a tragedy concocted in someone’s imagination. A real person named Jesus was nailed to a cross. He suffered a painful death. And all the time He was – and is – God. Holy. Blameless. Guiltless. Willing. I hope you’ll take time to read Psalm 22, then turn over and read the Gospel accounts of Jesus’ crucification today. He did that for you. And when your sin debt was paid, he said, “It is finished.” Paid in full. If you haven’t accepted Jesus gift of forgiveness, what better time to do that than on Good Friday – the day we remember and celebrate the cross? He has done it. 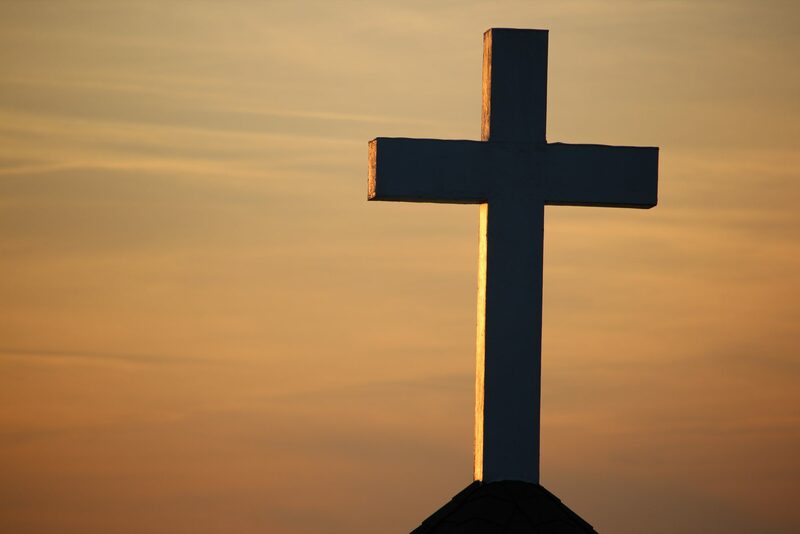 This entry was posted in Christianity, Daily devotions, Sin, The Gospel and tagged Good Friday, Jesus, Jesus is God, the cross, the crucifiction, the Gospel on April 19, 2019 by cazehner. Do you remember when, earlier in Saul’s reign as King of Israel, he couldn’t bring himself to kill all the Amalekites, even though God told him to? We read about that in I Samuel 15. God had told Saul to destroy the Amalekites, let no one live including women and children. Saul killed many, but not all. And remember, the Amalekites were the enemy of Israel and of God. Who knows how many guilty people were allowed to live on? Now we see Saul mad at a priest for helping David, who Saul considered his enemy. So Saul condemns the priest to death. Then, inconceivably, Saul ordered that all the priests be killed. Eighty-five men were to die that day – and they were no one’s enemy! In fact, these were men who served God. It doesn’t stop there. Saul then ordered that the wives and children of these priests be killed. He gave the same order to his men that God had given him earlier. “Let no one live.” The King’s officials couldn’t bring themselves to do it. But they didn’t stop it when someone else stepped up and began to murder all those people, either. A whole city of innocents was put to the sword that day, by the order of Saul. How could he let the ungodly Amalekites live, and then wipe out the people of God? I wonder. If the Amalekites represent sin, and the priests represent holiness, can’t we ask the same thing of ourselves? Maybe we aren’t the ones who are preaching and teaching partial truths. Maybe we don’t agree with the contemporary definition of sin, the tolerance of sin in our churches, the blatant disregard for God’s law. But are we, like the king’s officials, watching while holiness is being destroyed right in front of us? Do we shake our heads, maybe shed a tear, yet continue to stand there and do nothing to stop it? What can one person do, you might ask? I’m sure most of us reading this post today don’t want to see evil continue to wield its sword. But most of us feel helpless to stop this avalanche. And I don’t think God expects us to single-handedly. But I also don’t think he expects us to do nothing. Are you praying? Are you getting involved in civic affairs, volunteering in God-honoring work in your neighborhoods? Are you voting? Are you going to church, talking to people about Jesus, living your life in such a way that you stand out from the crowd? Are you holding your pastors and teachers accountable to speak only the Truth of Scripture? I don’t know what God has laid on your heart about fighting His enemy. But I know for sure if you are His child through the blood of His Son Jesus, He is prompting you to do something. You can either stand there and watch as God is being attacked, or you can get involved in the battle. You are going to make that choice today. Just know that just standing there and watching is making a choice against God. This entry was posted in Christianity, Daily devotions, Sin and tagged civic responsibility, daily walk, evangelism, holiness, obedience, the Truth on April 18, 2019 by cazehner. How is your prayer life? I have some dear friends who are true prayer warriors. They can pray for hours at a time, and to hear them pray out loud is like overhearing a conversation between intimate friends. No flowery words. Just heart-felt communication between them and God. I’ve confessed that I struggle with my prayer life. I want to be a warrior. But I continually fall short. Oh, I pray. Sometimes hundreds of times a day as God brings someone or something to mind. But I have never prayed for hours at a time. I run out of things to say. My mind goes to things I should be doing. I’m a work in progress. David was one that could pour his heart out to God, to lay it all out there, and trust God with the answers. David prayed for specific requests concerning life events. He prayed prayers of confession, and often on behalf of the people. Sometimes David prayed the same request more than once. But I think what I noticed today is David’s faith. He presented his requests to God, then left them there. I love Psalm 5:3. David didn’t just wait for God to answer his prayers. He waited expectantly. Every day. So here’s what I’m thinking: Instead of beating myself up for the lack of discipline, or the length of my prayers, I’m going to pray about the things God lays on my heart. I want Him to hear my voice every morning. And then, I want to look for the answers to my prayers throughout the day, expecting the evidence to be there. If you are one who has a disciplined prayer life, please pray on. We need your prayers. And I hope one day to join you in that kind of praying. But for now God is going to hear my voice every morning, without me looking at a clock. And then I will wait in expectation for Him to answer. This entry was posted in Christianity, Daily devotions and tagged answers to prayer, God hears our prayers, prayer warriors, praying on April 17, 2019 by cazehner.